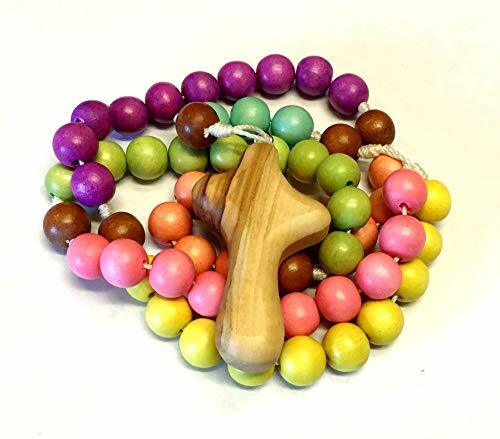 This colorful children's rosary is very sturdy. The Our Father Beads, and the cross are secured in place with white cord that is very strongly knotted. The wooden Our Father and Hail Mary Beads are each 12 mm in diameter and the cross is approximately 2 1/2 inches tall, which makes this rosary the perfect size for little hands. Each cross is unique and hand-carved from a single piece of olive wood from the area surrounding Bethlehem, the birthplace of Jesus. I purchased the crosses from The Caring Cross. This organization ensures that each craftsman receives a fair price to support their families. Please note that the colors of the beads may vary slightly from one rosary to the next. Sometimes beads are slightly lighter or darker. Also depending on your monitor, colors may appear differently, as well. Remember, each rosary is hand-made and unique. No two rosaries will be exactly identical. The rosary is available in several different color combinations. I also accept special requests if your little one has favorite colors. Children under 3 should only use this rosary under responsible adult supervision. It is not meant to be a teething toy, as small beads could become a choking hazard in the event that the rosary is damaged. The rosary will be shipped in a gift box. A handmade card and a prayer card will be included, as well. If you have any questions about this product by BC Inspirations, contact us by completing and submitting the form below. If you are looking for a specif part number, please include it with your message.